Sorry! This event has been postponed. Please join us for a special Friends and Family Showcase at the Center for New Music! Come to C4NM to engage with local artists, and help us keep musical invention alive! The evening begins with happy hour drinks and snacks at 5:30 PM. Then at 6:30 PM, you’ll enjoy the essential C4NM experience: an intimate performance of brand new music by world-class performers, and up-close interaction with the creators, inventors, and curators of the Bay Area’s unparalleled new music community. Get to know your local new music community, with music by C4NM’s 2015-16 Ensemble in Residence, the award-winning Friction Quartet, comments from renowned visiting composer Piers Hellawell (Belfast), an exhibit of invented instruments by Dennis Aman (pictured: Screaming Eagle 4-string wine box guitar), and a brief talk about the future of new music with C4NM co-founders Adam Fong and Brent Miller. 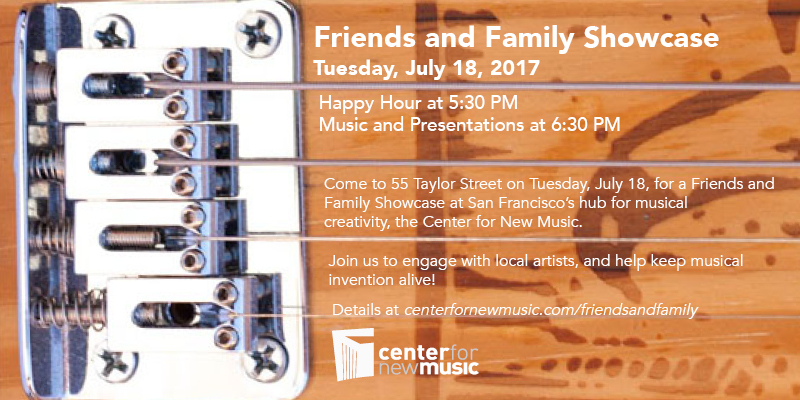 Please join us on Tuesday, July 18, 2017, for a Friends and Family Showcase at San Francisco’s hub for musical invention, the Center for New Music!